As promised, it's time to look at Mangion-Leverich, the game I played at the Hamilton Quads that I felt was one of the better games I've played in some time (though my recent hiding at the hands of our resident Lord of Darkness Mark Kernighan reminds me that one good game does not a good player make). Today's presentation is enhanced with multimedia add-ons, courtesy of Steve Ferrero (picture) and USCF (testament of glory). Side note: Conventional as the Najdorf may seem given its popularity at the club level, I've never fully understood its appeal. For the counterattacking riverboat gambler, yes, but many other seem attracted to this move order. In the Sicilian so much hinges on the strength of White's kingside attack, so to play ...a6 so early is no less a provocation to White than a fork in the eye. In blitz games I usually play quietly against it, but in long games I have tended to favor 6. Bg5 and try to start raining perdition on the g- and h-files. In this case, I had played that against my opponent in an earlier game and wanted to change things up. White has a comfortable position, but the original plan of playing for Sveshnikov-like control of d5 doesn't fully work here because ...Nbd7 has supported the key knight at Nf6. Meanwhile the e4 pawn needs protection, and I need a strategy on how to improve the position. I thought for several minutes here and decided to try if possible to attack Black's b6 pawn which looked a little shaky. 12. f3 Rc8 13. Rfd1 Re8 14. Be3 Qc7 Black is still cramped but is piling pressure on the c-file and preparing exchanges. 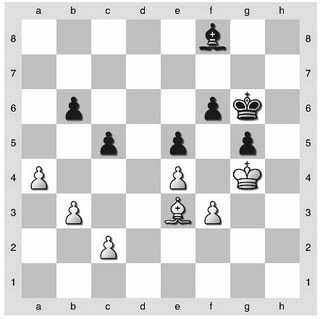 With an open file and a somewhat symmetrical pawn structure, Black should be able to get a draw with good play. However, White's minor pieces are slightly better and they have access to an excellent outpost on d5. I wish I had remembered Nimzowitsch's concept of a strong outpost acting as a fulcrum around which all your pieces can pass through and gain strength by their contact with it. As it is, I made adequate use of this idea as the game progressed. 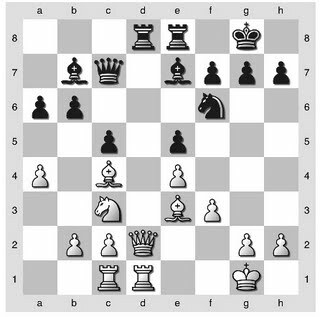 Off topic, if you ever wonder why the initiative is so important in chess, look at the remainder of this game and try to visualize Black's problems over the board - he has weaknesses to defend and (slightly) poorer mobility. 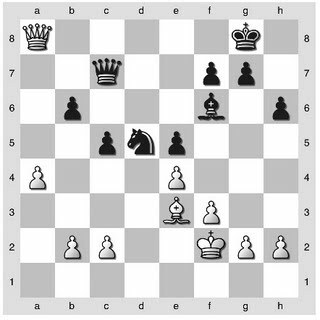 This defense requires modest precision, whereas for White to get a draw requires only offering it. This would be a dead draw for high-class players, but for us patzers when one side has most of the winning chances he will often convert. I decided to try to accentuate the superiority of my minor pieces through rook exchanges. Now white can add the d-file to his short list of assets. 28. ... Qc7 29. Qxa6 Nf4 30. Kf2 Nxd5 31. Qa8+ !?! A slight inaccuracy according to the computer - I rejected the chance for a passed pawn. Why? By 31. PxN I felt that I was setting up possible counterplay for black with an eventual ...e4 opening up my kingside. However, I think this was a good practical decision because (and only because) I was already a pawn up. If not, creating the passer might be my only chance for a win. 31. ... Kh7 32. Qxd5 Qa7 33. b3 g6 34. Bd2 Qc7 35. g3 Kg7 36. Bc3 g5?! Bad as the situation may be it has to be better for Black to sit on his hands and make me prove I can win. This just gives me a new front by which to exploit my greater mobility. 42. Qa8! Now the holes that Black has created in the kingside come to haunt him. The threats are not easily calculated 4 hours into this game. Many moves win here, I just missed that by moving the pawn I opened up the g6 square to his king. I will lose my extra pawn, but what follows is an instructive position showing the value of getting your pawns on squares oppositely colored to your bishop, something I had kept in mind since move 35 or so. And here Black resigned. Surprised? 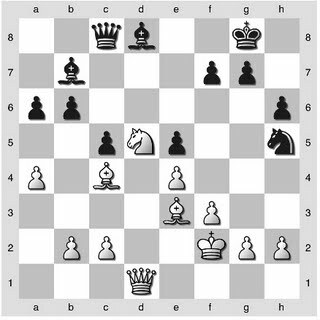 Black has absolutely no way of dealing with the combined threats of b4 leading to a passer on the a-file and the weakness of his pawns on the kingside - White's bishop will be able to attack both but Black's bishop will only be able to defend one. An example of the good bishop against the bad bishop. This is the game that finally got me above a 1900 rating (evidence below), hopefully better is yet to come. 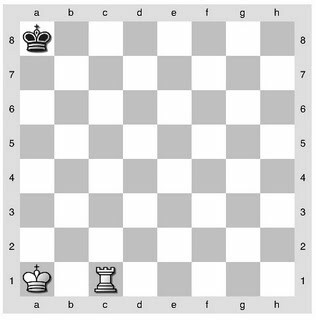 The moves are available free online from http://www.chessgames.com/perl/chessgame?gid=1557688, so I'll go very light on the pictures to save some time. A very common position in which Black is already threatening ...Bh3. 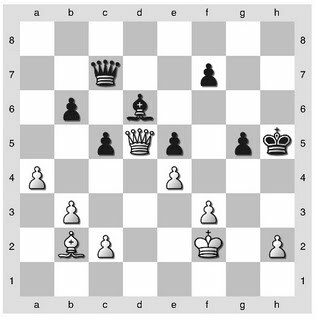 So a typical move from white would be 10. f3, allowing defense of g2 along the second rank. Carlsen, however, goes in for more dynamic play. 10. f4!? Qxe4 Carlsen goes in for an enterprising gambit, an interesting psychological choice given his opponent. Leko is known for his incredible solidity and he was undoubtedly looking forward to a quiet game after 10. f3. As he is unlikely to have prepared for 10. f4!? it must have been an unwelcome surprise, since the best move on the board is to accept the gambit with 10 ... Qxe4. Otherwise White's pawn center would quickly dominate. 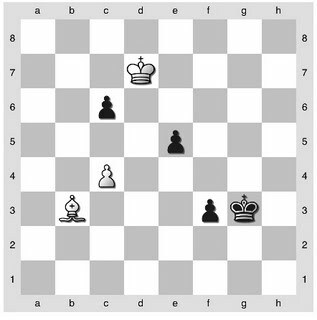 But now play takes on a different character, with White's pawn deficit being compensated by open lines and a lead in development, a classic imbalance. 11. Bf2 Bxd4 12. cxd4 N5g6 13. g3 O-O 14. Nc3 Qf5 White's light-squared weaknesses do not make a positive impression, yet his next move points out his trump, the weak nature of Black's Queenside. 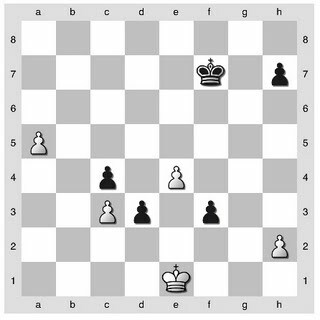 15. d5 a6 (prevents Nb5) 16. Re1 Kh8 17. Rc1 Bd7 18. Bf3 Rac8 19. Qb3 b5?! This seems overly committal...with b6 Black stays more compact and has better defensive opportunities. Now a6 is also a target. 20. Ne2 Qh3?! 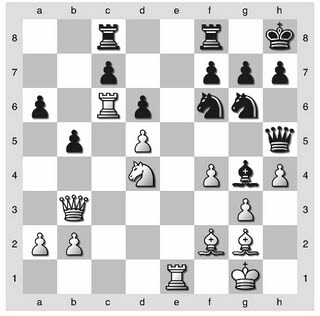 Looking for an attack when defense is more appropriate, Black has no claim to an advantage. 21. Nd4 Bg4 22. Bg2 Qh5 23. h4!? Sealing off the kingside in an unconventional way ...Ng8? This is just a blunder, there was no time for this maneuvering. Now the queenside is a wreck. White now recovers his pawn with interest as the Black pawns will start to drop. The rest of the game is desperation from Black trying to create threats on the kingside. 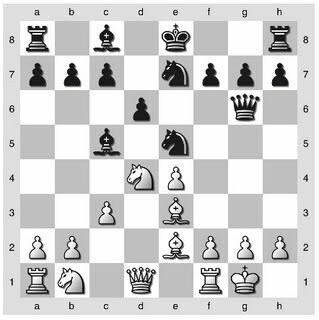 Note, however, the security of the White king despite the advanced pawns - his bishops are in ideal position to defend and yet attack the queenside, while his centralized knight observes the whole board. Also, open lines on the 3rd and 2nd ranks allow for lateral defense. The rest is offered for completeness. 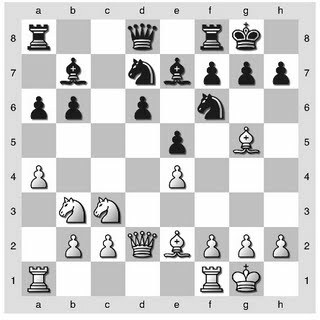 An opening disaster for Leko, who appeared to overestimate his chances with the pawn advantage. Tomorrow is Carlsen-Topalov, should be a firecracker. 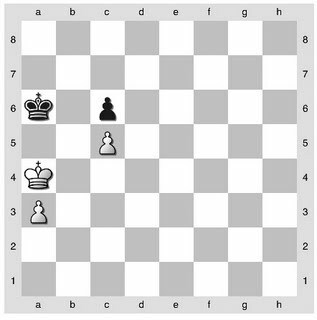 Take a look at this endgame and see if you can find a way for White to survive. The solution is in the comments. I made my twice yearly pilgrimage to the mecca of long time control, low stakes chess - the Hamilton quads. It's an interesting place...nowhere else can you really find people who are so purely into the game. The entry fee is $10 and the most you can win is $25 (minus entry fee and gas and a lollipop and you can count on being in the hole). Meanwhile, 40/80, 15/30, 15/30 etc etc time controls means that the higher rated quads are battling from morning until, well, midnight sometimes. There are even adjournments, a strange anachronism in a time when cell phones can be practically master strength on their own. Typically I do much better with the slow time controls, so I decided it was worth another visit. And as occasionally happens, it paid off handsomely - I finished +2 -0 =1 to win my quad, and more importantly should raise my rating above 1900 for the first time ever. This was my big goal for 2009, and until recently it seemed a bit out of reach. 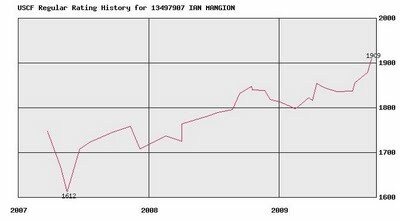 After reaching nearly 1850 while on a hot streak almost a year ago I regressed to the mean a little bit, and then found improvement hard to come by. But when it rains it pours, and in the last two months I went on my best run going +6 -0 =5 against an average 1820-rated opponent. That means that I'm back on track to win my bet with Don to become an expert, the prize for which is $1000 and dinner at Peter Luger's steakhouse in Brooklyn (right, Don?). Sometime later I will post bits of my best game from this weekend's quad, but before I do that I'll spend some time focusing on things I've neglected recently, like my garden and my actual job (sigh). For $400, can you solve this puzzle? s, since 4.5 points could be expected to be worth anywhere from $50-120 while 5 points might be enough for first place. My game ended in a draw after a few hours of tough fighting, leaving the 4 vs 4 matchup the lone remaining game in the section, playing for all the marbles (well, $400). ...and Black queens first, probably decisively. All White can do is hold out a slim hope for a perpetual check. 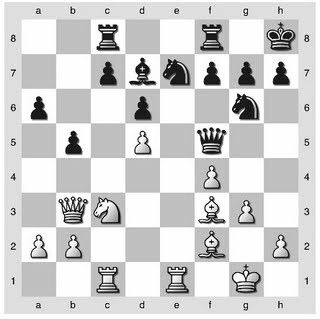 For $400 and the trophy can you find the winning move for Black? And White wins. Sic transit gloria New Jersey. Odd fact: White, rated about 1680, got steamrolled by yours truly in the first round and responded by winning his next 5 in a row in a tournament-of-a-lifetime performance to get a share of 1st. Crazy stuff, hats off to him. I just came back from the NJ state championship (for pictures see Mike Goeller or Jim West's sites), and there was a fearsome Kenilworth presence there. Ziggy, Mike Wojcio, Greg Tomkovich, Lou Sturniolo, and Steve Stoyko were some of the participants, along with several spectators from the club. Meanwhile, Joe Renna, myself, and Yaacov Norowitz all went into the last round sitting on 4.0/5 and with 1st place up for grabs in our sections. Massive kudos to Joe Renna who cooly converted his last game to get to 5/6 and 1st place in the U1300 section (which I expect will be his last U1300 event ever). A lukewarm handshake for me, when needing a win the best I could come up with was a draw for 4.5/6 and 3rd place in the U1900 section (hopefully my last U1900 event ever) and some cold cash for gas money. On the plus side I finished undefeated, on the minus side I did my Peter Leko thing with +3 -0 =3. Scorn shall be heaped upon Yaacov, who had the NJ title in his hands with a soft last round matchup against IM Dean Ippolito but walked away emptyhanded, having experienced the passed pawn's lust to expand firsthand. Whip out your boards, I'm skipping pictures for this one (except for Mark Kernighan who will visualize this in the corridors of his infinite mind). 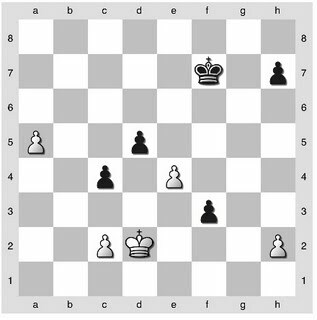 If Black sits on the a-file instead then White calmly advances up the c-file and mates on the a-file. 1...Kb7/Ka7 2. Kb3! Ka6 3. Kb4! (triangulation) Kb7 4. Kc4 Ka6 5. Kd3!! (5. Kd4? Ke6 is zugzwang) Ka5 6. Ke4 Kb5 7. Kd4 Ka4 8. Ke5 Kxa3 9. Kd6 and it's curtains. Too easy? 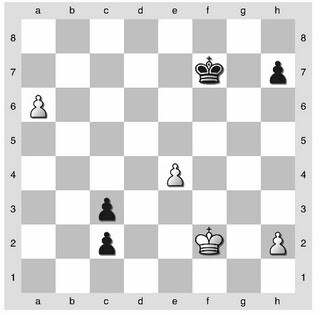 Try to win here as White, Black to move. Be careful not to walk into a trap.